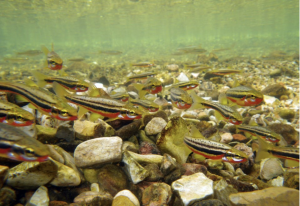 Oklahoma exhibits a striking diversity of small-bodied stream fishes across multiple eco-regions. Currently, our local fish projects have to main focal points: (1) Using extensive field sampling, historic museum collections, and ecological niche modeling, we analyzing current distributions and population trends for tier listed fish species inhabiting streams in Ozark region of Oklahoma. The goal of this project is to provide basic data for effective conservation management of threatened stream fishes. (2) Using our database of environmental conditions in northeastern Oklahoma streams, we are testing for correlations between environmental variables, population connectivity, and phenotypic variation in multiple species of small cyprinds and darters.